Discussion in 'UFC Discussion' started by shonuf, Dec 28, 2012. The weigh-ins take place at MGM Grand Garden Arena in Las Vegas, and the first fighter is on the scale at 7 p.m. ET (4 p.m. PT local time). Its normally bout 12 or 1 when in the US. Can't wait for this card, even if it has fell apart abit. Hopefully everything goes smooth. No surprises for once. Expect JDS to be a bit heavier than usual. My guess is around 243lb. WAR CAIN "El Toro" VELASQUEZ!!!!! I hope Cain weighs no more than 240-242 lbs. He seems to be getting heavier every fight which may affect his cardio. According to his interview with Helwani, he weighed about 244 yesterday, but be could come in less if he lays off the food. JDS told Helwani that he would be maybe 2-4 pounds heavier than his norm of 239. I don't think he needs to lay off the food, there is no cut for him. There's no cut, but the guy i responded to wanted Cain to come in somewhere between 240-242.
here's some pictures for reference. Horrible fight poster. Cain and JDS look shopped and fake. Am I the only one who looks like they made Cain look more ethnic in the poster? 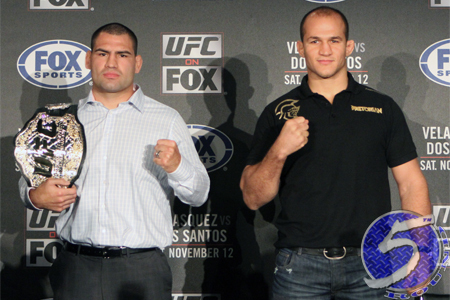 Also, JDS looks more angry at this pre fight presser. 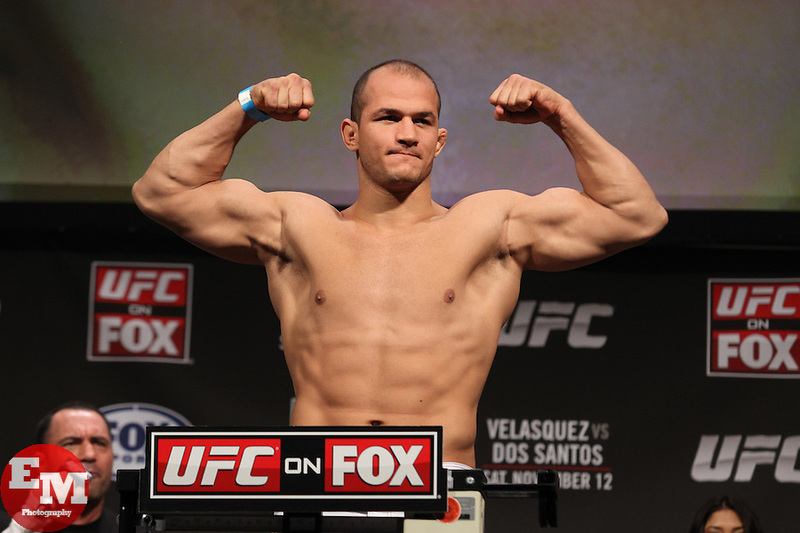 I never understood why they didn't take a new picture of JDS. Dana doesn't really care about that stuff but it's not like they haven't had a ton of opportunities. The picture of him looks like a caveman. He has bad unkempt hair, a caveman face, lines in his head, and that hairy chest. :redface: He looks like Captain Caveman. Take a new picture. And yes, i agree, in general, the post looks absolutely terrible. I didn't want to make a new thread about this, but can someone give me a link to Cain's "injury video" that everyone keeps talking about.